Product #60663 | SKU WVT-01 | 0.0 (no ratings yet) Thanks for your rating! Allows for a clean wirelessly-transmitted image of up to a 1500 foot range. It features a 5GHz ISM frequency band. This Tilta Wireless HD Video Transmission Suite Pro allows for a clean wirelessly-transmitted image of up to a 457m range. 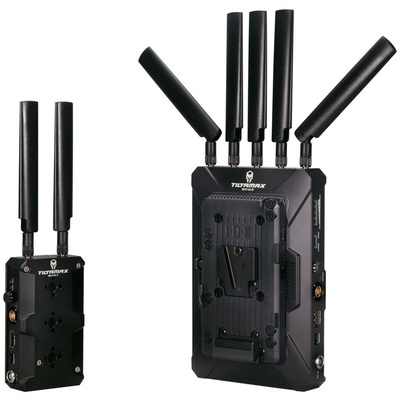 It features a 5GHz ISM frequency band with a maximum of 10 frequency channels that can be selected with the user knob so that you can avoid connection interference with other wireless systems. Simply rotate the channel dial on the transmitter and receiver so that they match in order to wirelessly transmit the video signal. By attaching the omnidirectional antennas to the top of the transmitter and receiver, you can get the most out of the unit’s range.